When it comes to renovating a home, even a tiny one on wheels, time and money spent on projects can quickly add up. Luckily, updating the interior of your RV doesn’t have to be time consuming or expensive. 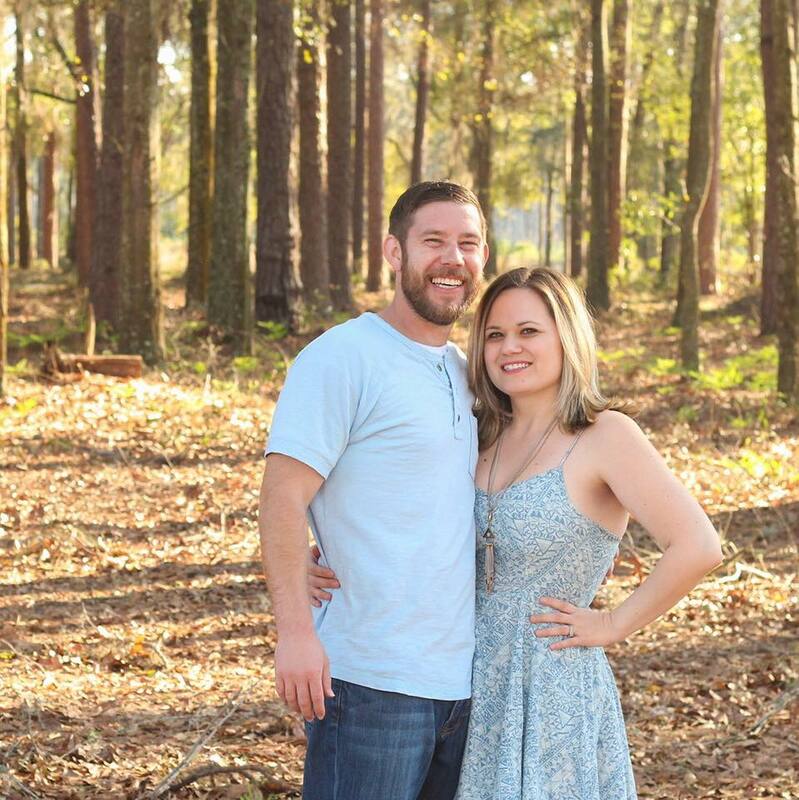 Here are a few RV updates that anyone can do. You’d be amazed how a coat of paint can freshen up the most dated RV. I won’t sugar coat it, painting the interior of an RV can be tedious and tiring. With that said, it’s also an affordable way to completely change the overall feel of the space. In other words, it’s worth it! Most RV walls are made of lauan plywood and have a wallpaper texture on top, which you can paint right over. Some walls, like those in your kitchen or bathroom, may have an added wallpaper border, which you can remove or paint over. My advice to painting the walls or cabinets in an RV is to first lightly sand the surface, then clean with TSP, follow it up with a good griper primer, and finally your paint. 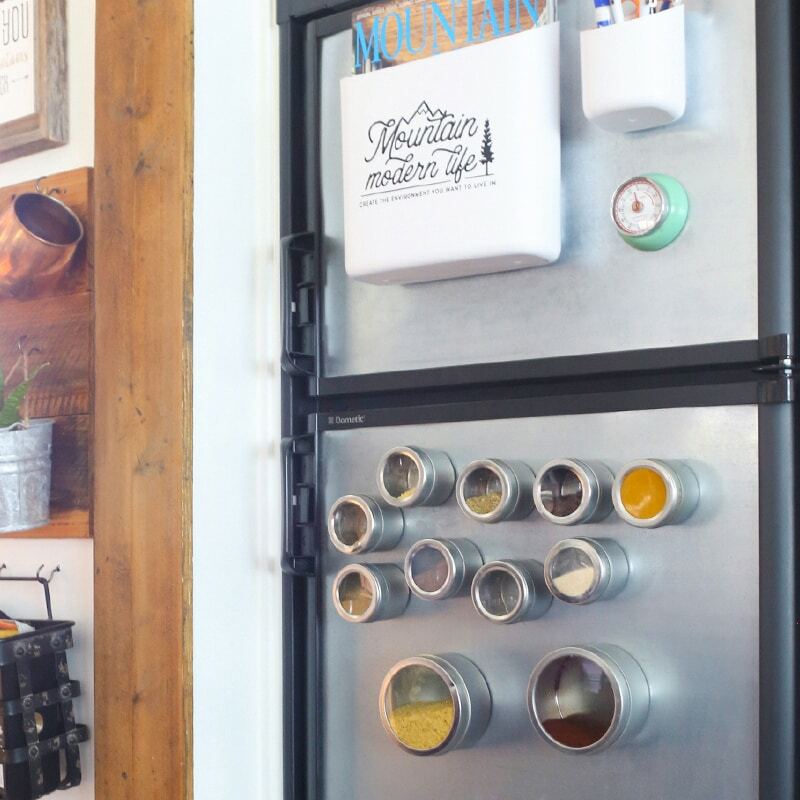 Chalk paint is another option to consider when it comes to painting your cabinets because it allows you to skip the sanding or priming process. These steps may add more time up front, but they’ll save you from repainting again later on down the road. Most of the furniture that comes standard in RVs is dated or covered in flourishes. While you can add a slipcover or have it reupholstered, you may want to consider replacing it with something else. Ikea is a great resource for affordable sofa options, or you may be able to modify existing furniture you own. The sofa in our RV was made out of a material our cats could destroy in minutes, and on top of that it was heavy and not our style. We had no plans to use the sofa bed so we decided to custom build one that fit the space and provide extra storage underneath. 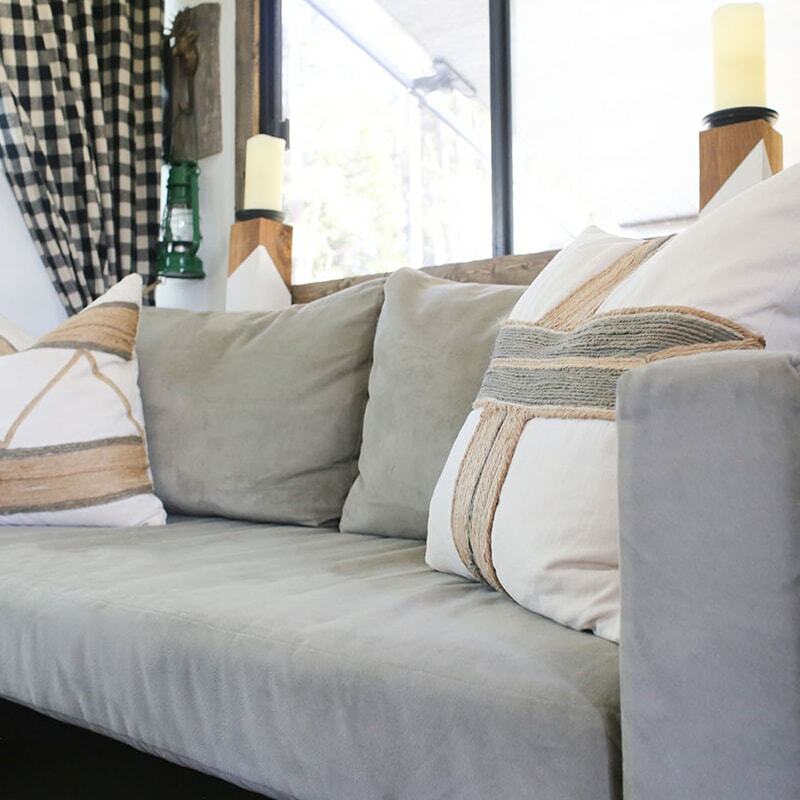 Removing the sofa or dinette booth in your RV may seem daunting at first, but it was much easier than we anticipated. If you’re unsure where to begin, these tips may help. Depending on the year of your rig, the appliances may be extremely outdated or worn out. If this is the case you may want to replace them. Looking for a budget friendly option? The appliances in our 2008 RV were in decent condition, but we wanted to make the fridge panels more useful. To do this we slid the heavy wood panels out and replaced them with sheet metal. Not only does this give the illusion of stainless steel, but it created a magnetic surface that we can write on with dry erase markers. Some other ways to update the fridge panels would be to paint them, possibly with chalk paint. Or you could add color, texture, or pattern using contact paper. 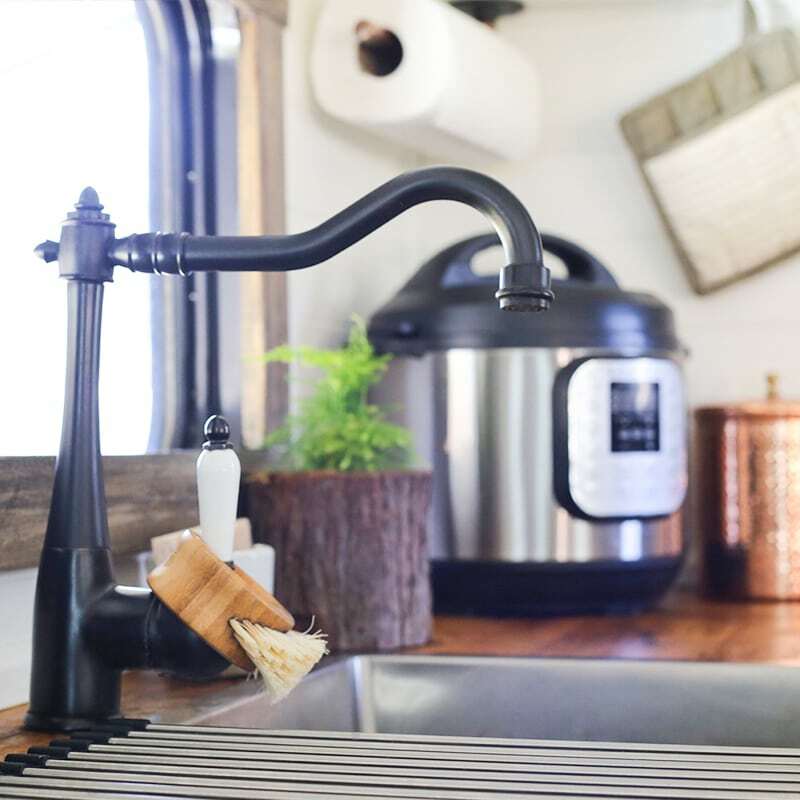 Chances are, the faucets in your RV are cheap and made of plastic. Not to mention they may be using more water than necessary. Give your kitchen or bathroom a quick facelift by updating the faucets to a style you love that will help conserve water at the same time. You can purchase faucets from any home improvement store and just need to be aware of the measurements. Determine the max height and spout reach you want before heading to the store or purchasing online. To help conserve water, I’d recommend going with a faucet that uses no more than 2.2 GPM, or you can always purchase low flow aerators. Have you felt the heat coming from the light fixtures in your RV, or are you just looking to lower your energy footprint? Either way, installing LED lights is much easier than you think. While you can swap out the bulbs in your dome lights, you can also replace the older dome lights with brand new ones. This process is easy and can help those lights disappear into your ceiling. If you’re looking for more creative replacements you can purchase just about any light fixture, as long as you use the correct bulb. For example, if you have a 120v light in your RV that you want to replace you can use any light fixture as long as you can screw in a 120v light bulb, and if you have a 12v light fixture in your RV that you want to replace, you can use any light fixture as long as you can screw in a 12v light bulb. You may also want to consider adding a voltage regulator wire to ensure your bulbs last longer. If you’re nervous about installing your lights be sure to contact a licensed electrician. 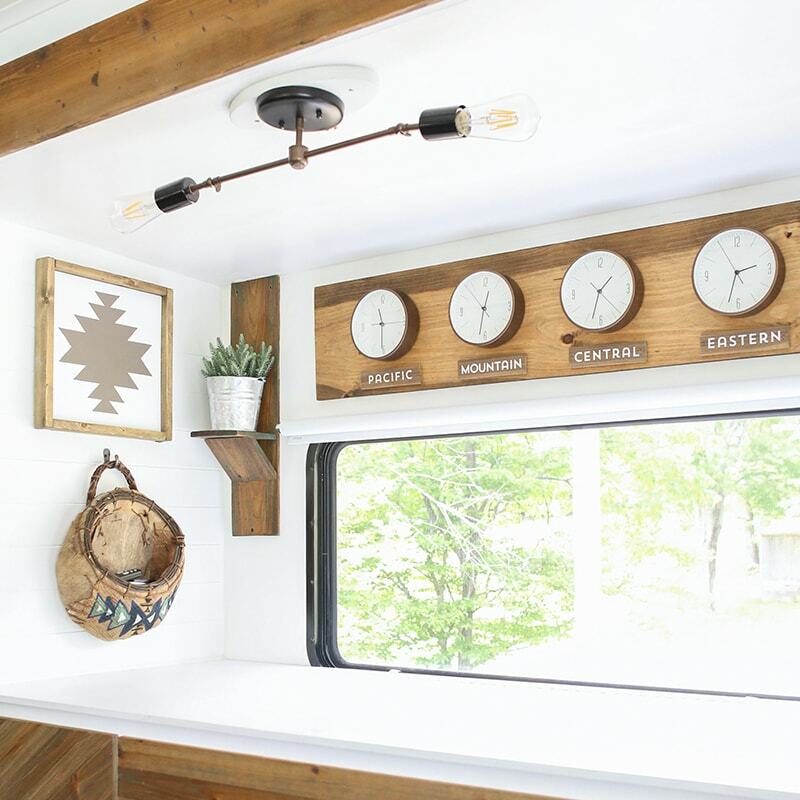 We created most of the lighting for our tiny home on wheels, but you can always purchase RV-specific light fixtures. The good news is there are more stylish options becoming available to the RV market. Have you ever wondered where RV manufacturers get the fabric for their window valences? And does anyone actually like them? While the valences in our RV were in pretty good condition, they were far from our style. The good news is valences are pretty easy to remove. You can keep them off, replace them with something else, or even reimagine them with new fabric. You’d be amazed how different your RV looks without the valences installed. Ours instantly appeared larger and brighter. Switching out the blinds for roller shades or curtains can instantly give your RV a cozier vibe. We opted for white roller shades and later built simple frames around our windows. 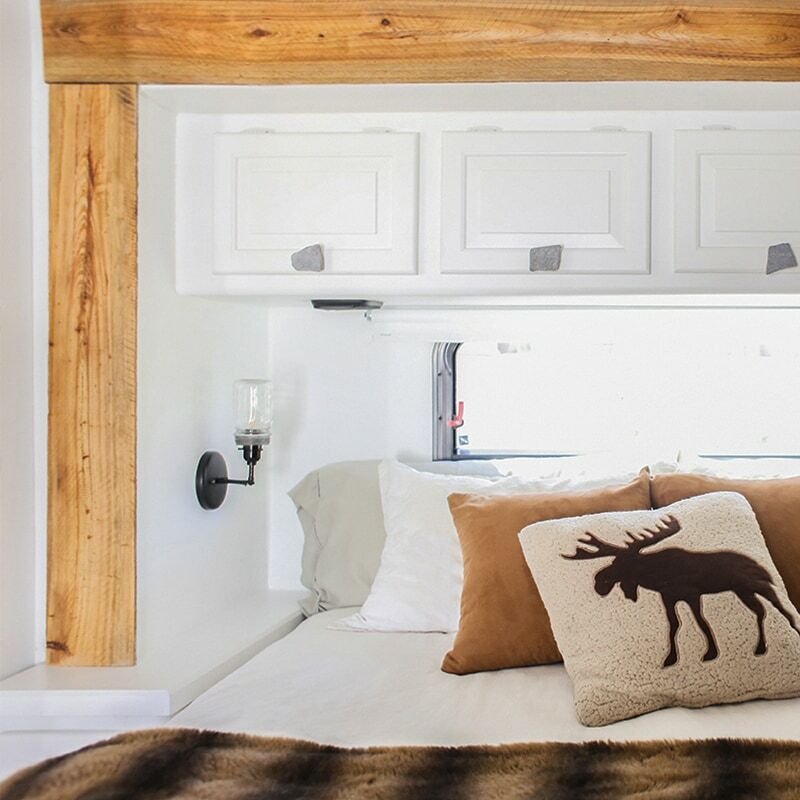 Adding your favorite decor is an easy way to transform your RV and create a space that reflects your personal style. You’d be amazed at what a difference can be made by simply swapping out the wall decor, throw pillows, bedding, and rugs. 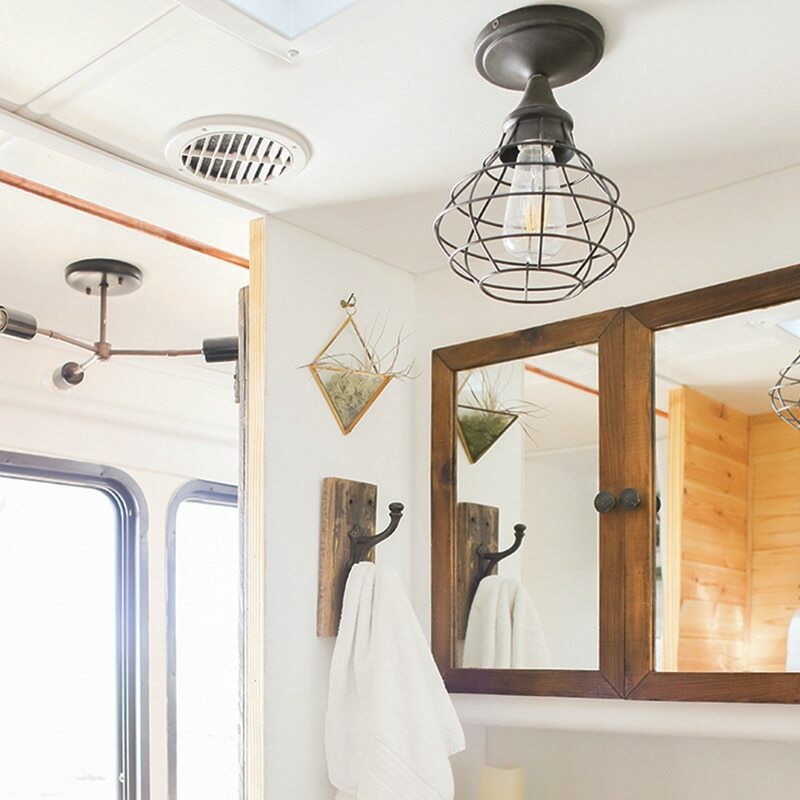 Unsure how to hang decorative items in your RV? 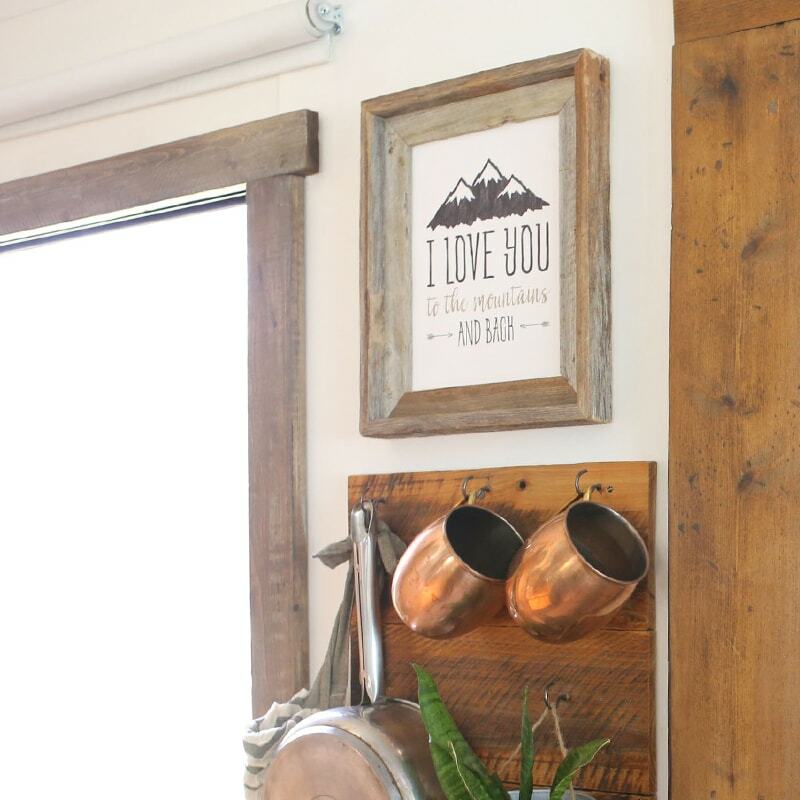 We’ve used a variety of methods depending on the situation, but a few options (aside from screws, nails, and pop rivets) are command hooks, industrial strength velcro, or mounting tape. We’ve also used QuakeHold to keep things on shelves we don’t plan to move around.